When is a Bishop not a Bishop? Answer: When he is an Ordinary. This is the hot news from the new Roman Catholic Ordinariate for disaffected Anglicans. With 3 Anglican Bishops becoming the first official members, Fr Keith Newton ( former Bishop of Richborough) has been appointed as the first Ordinary of the Ordinariate. But the Ordinary is most definately NOT a Bishop. Got that? Fr Marcus Stock, secretary general of the Catholic Bishops Council in England and Wales, has made the situation crystal clear .... "The Ordinary of the Ordinariate has similar authority and responsibilities to the diocesan Bishop, "
"He will be an ex-officio member of the Catholic Bishops Conference of England and Wales" he said. "The Ordinary will exercise collegiate responsibility for implementing resolutions within the life of the Ordinariate in the same way that a diocesan Bishop does within his diocese. So why is Fr Newton not a Bishop...? Is it perhaps the fact that he is married with 3 children. Certainly, the sight of a married Bishop might be a little too much for reluctantly celibate Catholic Priests - especially as they are expressly forbidden from joining the Ordinariate with its opportunity to be a married Catholic Priest. (Article 6 of the Anglicanorum coetibus) It will be hard enough to see Ordinariate Priests from the Cof E cavorting around with their wives, but to have a church sanctioned, sexually-satisfied Bishop - that might be enough to make grown priest cry! But that is not the only riddle arising from potential members of the Ordinariate this week. The latest comes from the former secretary of Forward in Faith, Capt G T Kirk, of the starship 'Oblivion' whose motto is "To boldly go where no woman can go before". Answer: When it is the Church of Sweden. In an extraordinary outburst, Captian Kirk, accused the Church of Sweden of "not being a Church anymore" because it accepts the ministry of women and homosexuals. In the Church of England Newspaper, he condemned the "Sweden-isation of the Church of England" and warned that we are going the same way. Some are calling for urgent action as a result, and a survey of how far this process has gone. Clergy may be asked to declare how many items of IKEA furniture they own, or if they have ever cooked meatballs for members of their congregations. Others are wondering who gave Captain Kirk the authority to decide whether a Church in communion with the Church of England is a 'proper' church or not. And signs of disunity are already starting to show among the 3 founder members of the Ordinariate. Unlike Fr Newton, the first Ordinary, who has been gracious in his words about the Church of England, Fr John Broadhurst, former Bishop of Fulham, went on record last October, describing the CofE as "vicious, vindictive, and fascist" following his decision to join the Ordinariate. But at least the Pope has a sense of humour. In naming the Ordinariate, "The Personal Ordinariate of Our Lady of Walsingham," he has, at least made sure that a woman will be at the very top of these opponents of women Bishops. 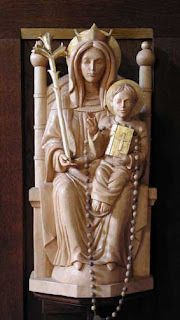 Talking of which, some may be tempted to ask, "If a woman was good enough to be the Mother of God, why can't a woman be a priest or bishop of God?" And that might just be a riddle worth pondering! That's an interesting blog - very cleverly written. Makes you wonder what God might think of all of this!